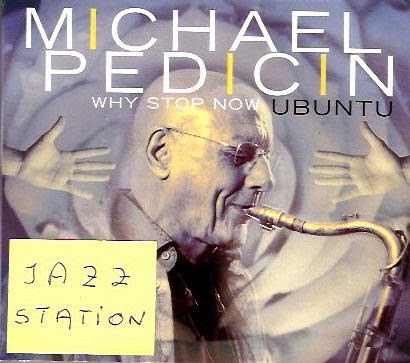 Jazz Station - Arnaldo DeSouteiro's Blog (Jazz, Bossa & Beyond): Instrumental Jazz CD of the Month - "Michael Pedicin: Why Stop Now / Ubuntu"
Instrumental Jazz CD of the Month - "Michael Pedicin: Why Stop Now / Ubuntu"
A passionately soulful improviser, tenor saxophonist Michael Pedicin is in the midst of an impressive creative surge clearly reflected in his prolific work as a recording artist and composer. His new CD, Why Stop Now ... Ubuntu, is his 12th as a leader -- and 5th in the last six years. Released on his GroundBlue label, this brilliant album reconfirms his status as a masterful post-bopper, and it's an impressive follow-up to two other great sessions: the haunting Ballads... Searching For Peace (2011), that led him to be voted #3 Best Tenor Sax Player of The Year in the 33rd Annual Jazz Station Poll, and Live @ The Loft (2012), that assured him the #1 position in the Tenor Sax category in the 34rd Jazz Station Poll. Much of the music on Why Stop Now was inspired by the 2012 Newtown tragedy, including the haunting ballad ("Newtown") by guitarist Johnnie Valentino and Pedicin's glowing impromptu solo passage ("Ubuntu"), which closes the album. "'Ubuntu' means 'human kindness,' an African philosophy focusing on our connections with one another," says Pedicin. "It echoes my constant hope for peace and connectedness in our world." Along with Valentino, who's been an essential collaborator on all of Pedicin's recent recordings, the saxophonist is joined by regular bassist Andy Lalasis and two newcomers to his working quintet, tasteful drummer Vic Stevens and rising young pianist Rick Germanson. Pedicin continues his relationship with producer Joseph Donofrio, best known in the jazz world for his work on Pat Martino's Grammy-nominated Blue Note recordings and also at the helm for last year's Pedicin CD Live at the Loft. Why Stop Now contains four originals by the leader, including "Trane Stop," a tribute to his musical hero, as well as two by Coltrane himself, "Tunji" and "Song of the Underground Railroad," a track heard on the expanded CD version of one of my favorite Coltrane albums, Africa/Brass, his Impulse! debut. "I lived my life admiring and idolizing Trane, every day, all day," Pedicin says unabashedly. "I identify with everything about him." Michael Pedicin, 65, grew up in a musical family in the Philadelphia suburbs. By the time he was 13 and had heard saxophonist Willis "Gator Tail" Jackson in person and Coltrane and Cannonball Adderley on record, he knew he wanted to spend his life playing saxophone. At 20, Pedicin began earning his living as a member of the horn section at Philadelphia's Sigma Sound Studios, where he worked for producers Kenny Gamble, Leon Huff, and Thom Bell, playing on sessions by such artists as the Spinners, the O'Jays, and Lou Rawls. He also went on the road with Maynard Ferguson, Stevie Wonder, and David Bowie. In 1980, Pedicin made his first album, Michael Pedicin Jr. (Philadelphia International). Subsequently he toured with Brubeck, and was a mainstay in the Atlantic City casinos, hiring orchestras and playing behind such singers as Frank Sinatra. Pedicin has since played a lot of straight-ahead jazz, formed his Brubeck Project (which released its debut CD in early 2011), and toured with such notables as guitarist Pat Martino. He also earned a Ph.D in psychology and, in addition to his musical activities, has a private psychology practice specializing in helping creative people. He's an active educator who founded Temple University's jazz studies program and is currently a Professor of Music and Coordinator of Jazz Studies at the Richard Stockton College of New Jersey. "As I began preparing my thoughts and writing the music for this CD, I wanted to fulfill the opportunity of bringing forth a message of unity," says Pedicin. "I feel that I must continue to create, and that my inspiration must continue to evolve in a way that brings me to new places. My hope is for enduring connectedness, peace, and human kindness in our world through the voice that I have -- the saxophone. Ubuntu."